Last year, German news outlets reported that the foreign intelligence agency would receive one espionage satellite. However, according to recent reports, the total may reach three. 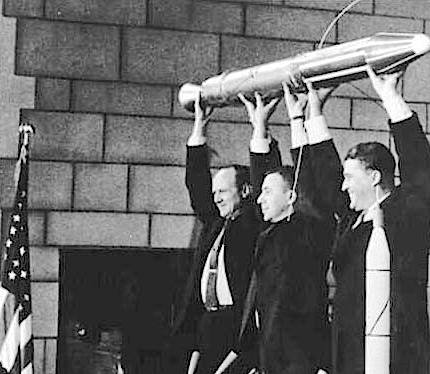 A model of Explorer 1, held by JPL's Director William Pickering, scientist James Van Allen and rocket pioneer Wernher von Braun. This started the "space race" with the Soviet Union. Germany will spend 400 million euros ($465 million) on the construction of “up to three new spy satellites” for its intelligence service, RND news group reported, citing security sources. Construction is set to begin this month. The budget committee of the country’s parliament (Bundestag) has already approved financing of the costly project, according to Die Welt. Last year, German news outlets reported that the foreign intelligence agency would receive one espionage satellite. However, according to recent reports, the total may reach three. In October 2016, the German parliament approved a controversial bill granting the intelligence agencies wider powers, including spying on EU facilities. The law was criticized as “unconstitutional” at the time. In February, Der Spiegel reported that the intelligence service had snooped on Western news media outlets and international news agencies, including the BBC and Reuters, since 1999.